Mr. Rod Vousden, Fellow of the Royal Philatelic Society of London, Assistant to the Keeper of the Royal Philatelic Collection at St. James’s Palace, and his wife Margaret made a brief visit to the British Virgin Islands on 13 October to carry out historical research at the National Archives for an important book he is writing. 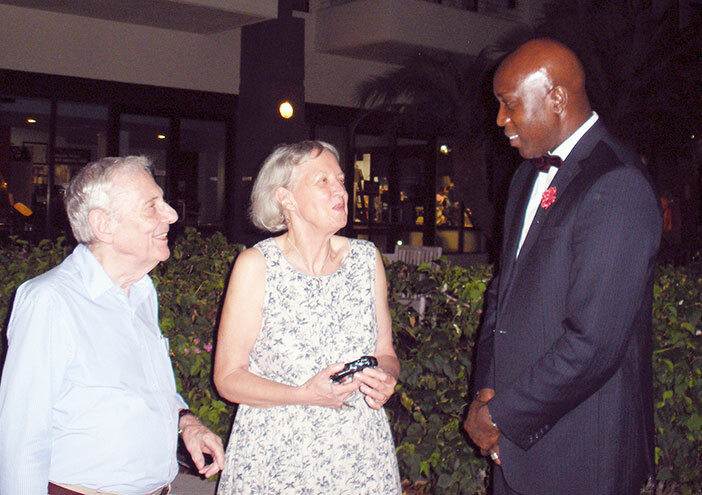 Mr. Vousden, who is also president of the King George VI Collectors’ Society and a former British Library Curator (1994-2003), and Mrs. Vousden met BVI Minister of Education & Culture, Honourable Myron V. Walwyn [at right in photo]who welcomed them to the Territory. During their stay in Tortola, Mr. and Mrs. Vousden met Dr. Giorgio Migliavacca, president of both the BVI Philatelic Society and the Italy and Colonies Study Circle, and spent a few hours with him talking about organized philately and stamp collecting. Migliavacca and Vousden had first met in London in 1999 at the British Library when the BVI stamp expert was carrying out research on the Crown Agents Philatelic and Security Printing Archive and related records held at the British Library to finalise the “BVI Specialised Stamp Catalogue, 1787-2001” of which Migliavacca was the editor. Shortly after Migliavacca had the privilege to view the BVI section of the Royal Philatelic Collection at St. James’s Palace for the purpose of recording rare BVI stamps and very scarce and unrecorded varieties. This visit to St. James’s eventually led to the presence of the Royal Philatelic Collection at the exceedingly successful 10th BVI Stamp Exhibition in 2002 – the first time ever highlights of the Royal Philatelic Collection were exhibited in the Americas.